Learning a language goes beyond just studying for an exam. It is a skill for life that opens so many doors, gives people choices, broadens one’s horizon in so many ways. 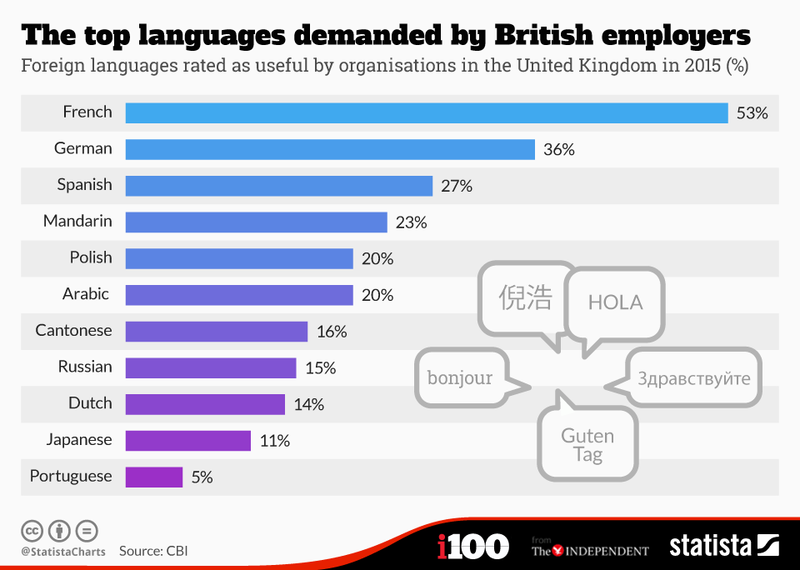 French is the most useful language British employers look for on CVs, according to a recent study. Adequate foreign language skills were one of the most highly rated concerns for employees looking to hire, the Confederation of British Industry study found. More than half of employers wanted workers who can converse with our Gallic cousins, and 36 per cent were looking for German speakers, presumably because the major European economies are a big market for British goods. Spanish, useful in the fast growing economies of Latin America, came in third, and Mandarin, the most widely spoken first language in the world, came in fourth with 23 per cent. Our department consists of a strong team of passionate linguists whose enthusiasm for languages is one of their main assets in the classroom. Between us we can offer a variety of specialisms, covering literature, linguistics, translation, history of language, slang, culture, politics and art which all mesh together in order to offer our pupils the broadest and most unique experience of language learning possible. Whether the students are working in our language lab during lessons, are engaging in ipad based activities or studying at home they always have access to the latest online and digital resources for lots of support and guidance in their language studies. Pupils joining Caterham in the First Year are required to study two Modern Foreign Languages. They can choose from French, Spanish or German. They study these languages through to the end of the Third Year prior to making their GCSE choices. In addition, at the start of the third year they have the opportunity to embark upon a beginners’ course in Italian or German. At the end of the third year, pupils can choose to study one, two or even three languages from German, Spanish, French and Italian for their GCSE. First Year Disneyland Paris, First & Second Years Spain, Sixth Form Madrid. French: Second Year to Upper Sixth exchange to Nay with Saint Joseph School, South West France. German: Third Year to Upper Sixth exchange to Ansbach with Gymnasium Carolinum, Germany. Spanish: Fourth Year exchange to Madrid. 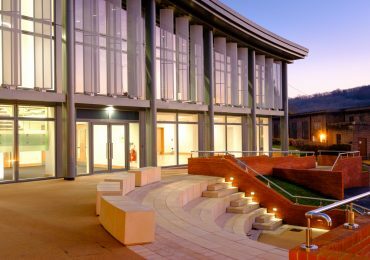 Links with schools: Italy, Spain, Germany, France, and London Academy of Excellence. Language Assistants: small conversation classes with GCSE and A Levels. This Department consists of several experienced graduates, who all teach more than one language. After graduating from the Université de Provence (France) in Modern Languages, Nicole gained her PGCE at Saint Mary’s College, Strawberry Hill, Twickenham. She has taught French, Latin, German and Spanish at her previous schools and teaches French to A2 level and Spanish to KS3. Within the department, she runs the French Sixth Form Society and the newly established French Exchange to Nay, near Pau .Outside the department, Nicole is the Deputy Director of Sixth Form. When she is not at school, she enjoys travelling and skiing as well as spending time with her family. Catherine is a BA Hons graduate in French and German (University of London). She has been on the Caterham staff for a number of years, having previously taught in two other independent schools. Currently she is teaching German to A2 level and Spanish to First Year and beginners Third Year. She is particularly interested in contemporary and late 20th century French and German literature and cinema, and enjoys taking pupils abroad on study visits and latterly the newly established German exchange to Bavaria. Outside school, she spends as much time as possible in France, Germany and Spain and playing sports. Neil studied Spanish at Durham University and European Politics at Cardiff University. He has taught at Christ College, Brecon and Monmouth School. Neil coaches the U14 B rugby team and helps out with Duke of Edinburgh expeditions. He also teaches Italian and French. Carlos graduated from the University of A Coruña as a Primary School Teacher. After setting in England he worked as a Spanish Assistant in Croydon High School for two years while studying for an English and Spanish degree with the Open University. He undertook his PGCE at Kingston University and currently teaches Spanish to A Level and French to KS3. His interests include travelling, politics and gastronomy. A graduate of the University of Sheffield, Warren joined the Caterham Modern Foreign Languages Department in September 2013. Warren teaches German and French to A-Level and loves the rewarding process, unique to language-teaching, of helping pupils to develop from language-learners into linguists. He is a big supporter of the school’s excellent French and German exchanges to Nay and Ansbach respectively, and recommends that all budding linguists take part in them. When not in the classroom Warren can be found coaching the U12 B rugby team, playing golf or looking baffled over a cryptic crossword. Zoe graduated from the University of Bristol and went into banking. She soon realised, however, that she wanted to teach and so completed a PGCE in Modern Languages at the University of Cambridge. Her first teaching post was at Cheltenham College teaching French and Spanish from Y7 to Oxbridge level. Then followed a years’ travel all over the world before returning to teach at Caterham School in 2005. Since then Zoe has held the role of MFL teacher, Head of Spanish for two years and now currently Acting Head of Second Year. She continues to thoroughly enjoy teaching all year groups and enthusing pupils with a love for languages. Kim graduated from Cambridge University with an MA in French and German and spent three years in the City before settling upon a career in teaching. He joined Caterham in September 2004. When he is not teaching French to A level or German to GCSE Kim is the Director of Learning and Teaching here at Caterham, and coaches Hockey. He also works as an independent trainer in the field of education. Kim loves travelling and has visited 52 countries to date. He is also a passionate England, Quins, and Spurs fan.